Vision Insurance - Learn About Vision Coverage - Natwick Insurance, Inc.
What's more important to protect than your eyes? Work with one of our vision insurance specialists to get the coverage you need at the most affordable price. Vision insurance is a form of insurance that provides coverage for the services rendered by eye care professionals such as ophthalmologists and optometrists. The typical vision insurance plan provides yearly coverage for eye examinations and partial or full coverage eyeglasses, sunglasses, and contact lenses, with or without copays, depending on the plan chosen. If you see the big picture, you know how important eye health is to overall well-being. A little attention to those baby blues, browns, greens, or hazels can make all the difference. 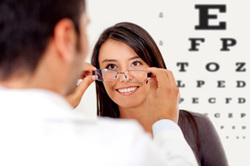 We can help you obtain affordable vision coverage including an annual routine eye exam for a low copayment. Plus you get coverage for contact lenses or eyeglass lenses and frames—including designer names.